I can't say that I've had a lot of vodka from New Zealand. Or really had a lot of anything from New Zealand for that matter. If you can't remember where or what New Zealand is, it's right by Australia and is where the Lord of the Rings trilogy was shot! A gorgeous, gorgeous place! 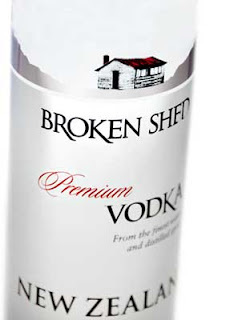 So this is Broken Shed Vodka, a spirit produced out of Wanaka, New Zealand. The coolest thing about this vodka is that it's made from... whey. That's right, the stuff that's in milk. Whey is also the most popular ingredient to make protein powders from. But who needs protein powder when you have VODKA?! Anyway, Broken Shed vodka comes in a classy, relatively simple bottle with a nice cork (I love bottles with corks) and pours clear as clear can be. It smells almost of nothing, with the vaguest hint of alcohol and a bit of sweetness. Tasting brings the crisp, refreshing tastes of mineral water with an underlying mild sweetness followed by a slightly bitter mineraly finish. The mouthfeel is a little silky and sensual, which is characteristic I love in great vodkas (although some premium vodkas lack this trait). Bottom line, this is a great vodka at the ~$35 price point. Comparing it to things I've already reviewed I would have to say it tastes somewhere between I Spirit Vodka's sweetness and 44 North's mildness, both of which are also premium vodkas. Broken Shed is just a great tasting vodka: mild, easy-drinking, and having a hint of sweetness. I tried it neat at room temperature, over ice, and in a screwdriver. All were great. Surprisingly, though, when mixed with orange juice it does seem to bring out a touch of menthol flavors which were actually quite interesting, yet incredibly tasty in the mix. Go check out Broken Shed Vodka's website and Facebook page. Tell 'em Bob sent ya! Drink This: if you want an incredibly tasty, unique vodka.